It's strawberry season in the Pacific Northwest! Oregon has these wonderful, tiny berries called Hood Strawberries that are totally unlike any store-bought berry I've ever had. First, they are tiny - like the size of a gumdrop. Second, they are dark red all the way through, and not hollow. Totally unlike the white insides and hollow cores of store-bought berries. Last, they keep for about 20 seconds. You pick 'em and eat 'em. Or, let them sit on your counter all day, sort of mush-out and decide to roast them and make strawberry shortcakes. We liked this idea. 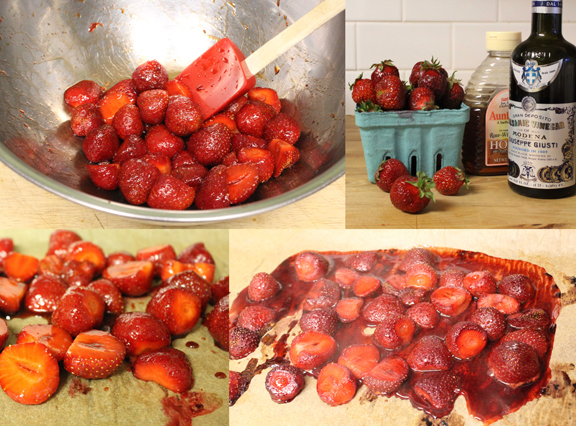 Whisk vinegar and honey, toss in strawberries and stir to coat. Line a rimmed baking sheet with parchment and put all of the berries, and add all of the vinegar/honey mixture. Roast until berries are very tender and juicy, about 25 minutes. Combine flour, baking powder and salt. In a separate bowl combine honey and cream. Stir honey and cream into flour mixture and add strawberries. Stir just until combined. Drop biscuits onto parchment lined baking pan and cook for 15-18 minutes or until bottoms are golden brown and tops are lightly golden. 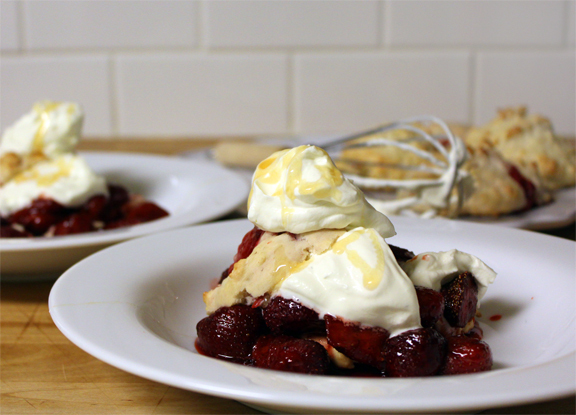 To serve, slice biscuits in half, scoop roasted strawberries off the parchment, tying to save as much as the delicious juice as possible, top with whipped cream and a drizzle of honey.